We describe a physically-based Monte Carlo technique for approximating bi-directional reflectance distribution functions (BRDFs) for a large class of geometries by directly simulating optical scattering. The technique is more general than previous analytical models: it removes most restrictions on surface microgeometry. Three main points are described: a new representation of the BRDF, a Monte Carlo technique to estimate the coefficients of the representation, and the means of creating a milliscale BRDF from microscale scattering events. These allow the prediction of scattering from essentially arbitrary roughness geometries. The BRDF is concisely represented by a matrix of spherical harmonic coefficients; the matrix is directly estimated from a geometric optics simulation, enforcing exact reciprocity. 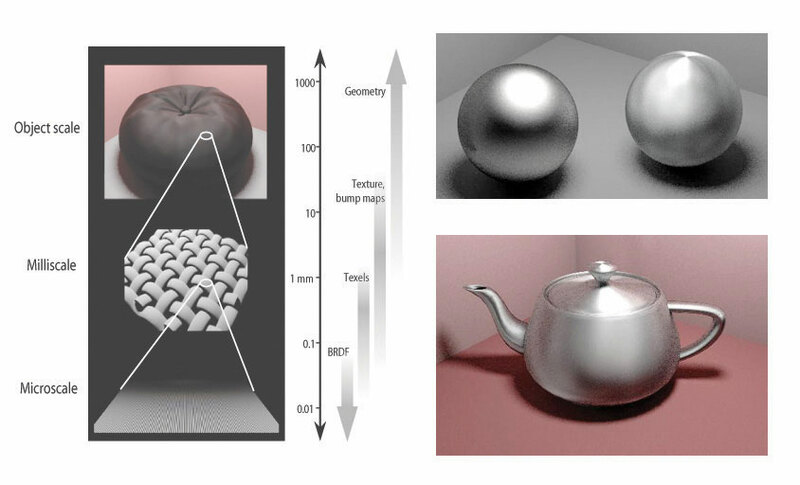 The method applies to roughness scales that are large with respect to the wavelength of light and small with respect to the spatial density at which the BRDF is sampled across the surface; examples include brushed metal and textiles. The method is validated by comparing with an existing scattering model and sample images are generated with a physically-based global illumination algorithm. This paper is available as a compressed Postscript file WAT92.ps.gz (802K).